The MIT Sloan Sports Conference is something that has interested me for a number of years. Brought to my attention in 2009 by Bill Simmons shortly after Daryl Morey (founder of the conference and GM of the Houston Rockets) had been hired. I had been fascinated by Morey's ascension to front office from a statistical background. A New York Times piece on the undervaluation of Houston defensive stopper Shane Battier, and further profiling on Morey fascinated me even further. Morey is lovingly referred to as Dork Elvis amongst Sloan aficionados, both for his role in founding the conference and in bringing analytics to the forefront of everyday sports conversation. I had been casually following the conference for a while, as I remain pretty curious about analytics and statistical advances in all sports. Articles like this one David Staples wrote after attending the conference last year caught my eye, along with posted panels on YouTube from past years' conferences like this one featuring Brian Burke, Peter Chiarelli and Mike Milbury. There were reportedly representatives from 29 of the 30 NBA teams this year, and I assume a fairly large contingent from the still-burgeoning analytic side of the game in hockey. Last year's attendees apparently including represenatives from Calgary, Dallas, Boston, Pittsburgh, Tampa Bay, Washington, and Vancouver along with Burke and Chiarelli. The student price was only $400, so me and an analytically curious friend (studying Medicine in Calgary) spent the whole weekend following the Twitter feed obsessively and swapping texts lamenting our lack of foresight to attend and have an excuse to go to Boston. Neil Olshey, former soap opera actor turned sports executive and current GM of the Portland Trailblazers, speaking to ESPN's TrueHoop blog about the intersection of analytics and gut feeling. Really charismatic and well-spoken guy, which should be expected from a soap actor. But he seems to be very grounded, affable and open-minded. Interesting guy and seems to have an excellent philosophy (from the interview at least, hard to make any concrete conclusions from eight minutes of video). Embedded video clips didn't work for some reason so you'll have to click the link. The great Katie Baker over at Grantland talking about her experience at the conference, and towards the end laments how it's becoming harder to just sit down and watch a game without thinking skeptically about strategy and the statistical significance of each event in what is the typically chaotic and reaction-filled game called hockey. Grantland's truly excellent basketball writer Zach Lowe sitting down for a video podcast (vodcast?) 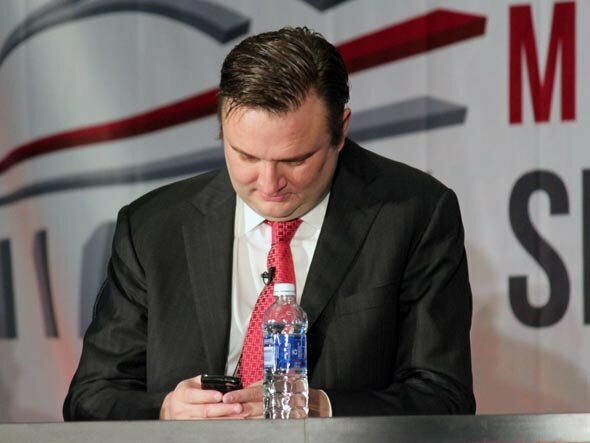 with aforementioned conference co-founder and Rockets GM Daryl Morey discussing a number of things basketball, Rockets and Sloan related. He interestingly talks a bit about how a trade deadline deal for recent 5th overall pick Thomas Robinson from the Sacramento Kings went down. Interesting paper by Harvard grad Eric Tulsky, on zone entries and the effects of carrying the puck into the attacking zone and dumping it (hint: carrying the puck with control generates twice as many shots as dumping it, according to the paper). Lots of man hours were put into tracking these events and some really interesting findings that could signal the beginning of tactical applications of analytics in hockey. At least it represents a sort of jumping off point. One of only two hockey papers at the conference, and no hockey panel this year which was sort of disappointing. Kirk Goldsberry, another Harvard scholar, was from all reports a rock star of sorts at the conference with his company CourtVision and what he calls "spatial and visual analytics." Using data from SportVu (missile-tracking cameras that track every single movement by a player at every single instance of a game) to examine the great basketball unknown that is interior defense. He actually introduced CourtVision at last year's conference and has written different articles of his findings including visual cues. I fail to say why similar camera tracking isn't on the horizon for the NHL as they play in many of the same arenas. Should be interesting to keep tabs on that going forward. One thing I think is essential to Kirk's work is his visual presentation. It is the communication aspect of analytics that is lagging far behind. Front office execs who have only remedial knowledge of these deeper statistical inclinations don't want to spend time digging through spreadsheets and learning formulas and doing half-split variability tests. And oftentimes this information and data sets are so complex that to summarize its process and findings in a five minute oral presentation doesn't do it justice. Accessibility of information is paramount in spreading its growth, and I think this is great work in advancing the visualization of analytics. I could definitely see this type of thing being where this whole thing is heading in the near future. An interesting tweet retweeted by the conference's Twitter account from a panel including former Magic coach Stan Van Gundy. This small tweet of less than 140 characters represented an important issue to me and shows the gulf that still exists (and needs to be bridged) between frontline staff, like coaches, and backroom staff, like analysts. #ssac13 SVG is explaining how its hard to play frustrating player even if numbers say they're good. Seems to be common issue. Good roundup here from some random blog I found talking about panel highlights and what the focus seemed to be veering towards this year at the conference. This included bulletpoints from the keynote panel "Revenge of the Nerds" which featured election witch Nate Silver, Morey, Michael Lewis, Paraag Marathe, and Mark Cuban. There was a lot more interesting stuff I found floating around, but this was the stuff that caught my eye the most. I may yet add to it, but I'm still reeling from missing out on my chance of being there.